Visiting Kodaikanal is always cool and comfort since this place accompany me easily or I got to be familiar as I visited it unlike any other places and the climate is completely blissful at any time of the year. At other hand I feel sorry for this princess of hills station which is turning into concrete valleys and mountains being carved for real estate lands and natural environs polluted by carefree tourist and vehicle population had turned down this pristine town, but we can’t blame anybody as they all come to enjoying what I cherish, a little concern on its behold state will do better. 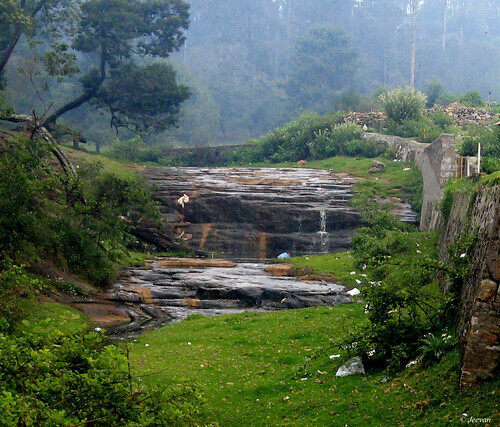 There are many places to steal our heart and sight at Kodaikanal but for better refreshment and entice one need to extend their limit out of the town and I wish only people who love and care for the nature should led so. 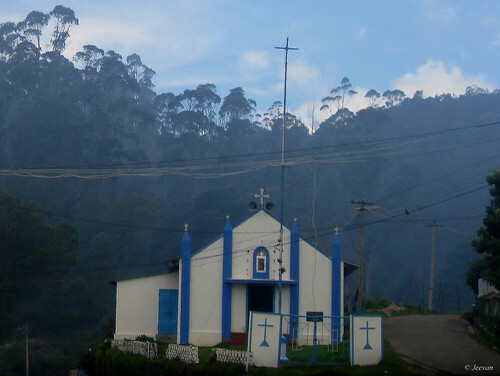 During one of my visits to Kodaikanal I find the pretty little church in the picture above, bound to a mist environment and light blue sky behold my attention for its simple white blue structure, on the Pillar Rock Road. Following the church, the little falls with stream like structure is another wonderful sight that come along the way near a shopping complex that sells homemade chocolates and eucalyptus balms. It seems only during the rainy season the water flows here but today it looks pathetic with plastic wrapper shattered around and growing shops on one side. It could really be a good attraction to the visitor if it was taken into cleaning and cut wild shrubs and protect from people throwing wrappers in. I wished not to miss this movie watching in theater, and went for a late night last show in drive-in, the only theater I could visit and more over the director of the movie, K.V. Anand is one of my favorite filmmaker in Tamil lately whose movies make me look forward his next venture and I feel he’s someone special in creating quite content and quality films on the mainstream cinema. 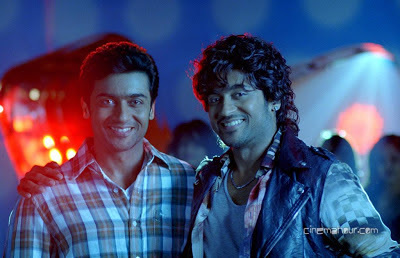 Maattrraan is also a unique movie dealing with conjoined twins and we have seen many movies on twins early but this is something different for which the director has to be appreciated. This is very interesting and amazing to see how conjoined twins survive with different style and attitude on their own with no space for personal or privacy since both stick together.... the film make a thought on the real conjoined exists. The movie not only left with the conjoined twins but also handles a serious social subject on adulterated energy drink as alternate, the movie rides on a roller coaster of action thriller, glamour and social science and technology. As Vimal and Akhil, Surya plays the dual role perfectly and there’s nothing to say about his acting because he had lived to the core of the subject and the action sequences are stunning with merry first half and serious pursuit rear. The director was dare to develop a story tracing back to Ukraine, revealing a real mystery flight crash and the country’s well performance at world games by the athletes based on steroid in 80’s moves the Tamil cinema into a international platform. One important thing that leaves at amaze and spellbind was the cinematography; the director who itself an outstanding cinematographer doesn’t need much to say how well the visual performance must be... he makes everything look at the state of the art. Sachin Khedekar as Ramachandran does a great job of father and genetic scientist, wearing a smart face of veil hiding an evil and Kajal Aggarwal holds a partially chief role alongside Surya, adding glitz and glam to cheerful; and one of the drawbacks of the movie was the early grip loose of the suspense but the director dragged as much possible tighten and loosing the thread like a kite before landing on ground. The songs were a kind of usual Harish Jayaraj flick and the intro song was fascinating with apt lyrics and the duet was remarkable capturing the wonders of Norway. Could easily feel the hard work of each crew behind the screen and without going deep in research on the technicians and technology used off-screen I appreciate all the emphasis given from behind to behold. Overall Maattrran is a better transformation or enhance for Tamil cinema on the commercial front. that ever so clearly invisible. that never seems stop seizing. defeat all her distinct features. 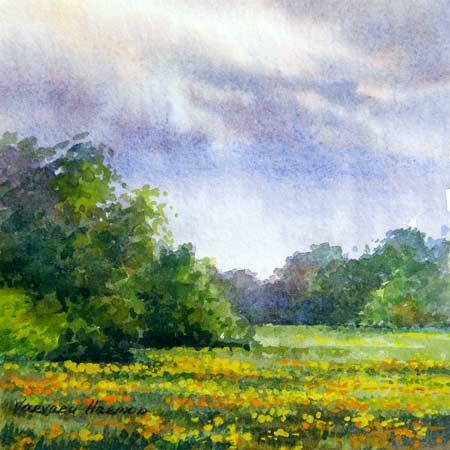 that embraces beauty and elegant. that envision was future imparted. a delight like never before. an arm, excluded of hands. through the perch of bird. 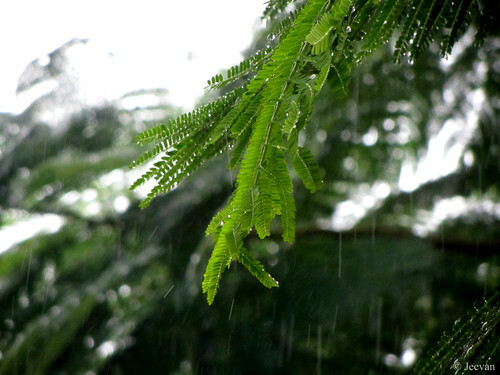 develops into a small rain-forest. enhances the lives of farmers behind. It was a feeling of enthusiastic when my uncle announced that we are going to Dolphin City in the evening and I was on my way to barbershop for hair cut when hearing it, but couldn’t resist dreaming on Dolphins actions on the Discovery Channel, sitting to the rolling chair while scissors trim the hair. It was the time we were residing on the upper portion of my maternal grandparent house in Thiruvanmyuir while we rebuilding our own in Adyar – both were neighboring areas of south Chennai – the barbershop was in the ground floor of my grandparent’s two storied building. From the time I get to remember things, I’m cutting hair from the same salon and even today the barber from this salon comes home to get trim my hair and bread. The one who runs this shop for years had become our family friend in the latter run and who sincerely care for me and never took money to cut my hair but I’m not sure and haven’t asked my grandfather whether he balance the pay with the rent. It was a Sunday evening, as usual, with close family members get together at grandparent’s house and since we sojourn from the same building, it was more cheerful for us to stay connected throughout the day with dear ones. In two cars we reached the Dolphin City in the early hours of evening, which is about 43km from Chennai and 10km before Mamallapuram on the ECR (east coast road), opposite to the then famous amusement park Little Folks, who initiated the first on its kind of fun filled water park in the country. We parked the cars on either side of the ECR, adjacent to the walls of amusement park and with great excitement we entered the park where a disappointment waits for us to learn that Dolphin show was canceled due to illness of the species but Sea Lions show was available alternatively. After discussing sometime our elders take the right decision and gladly that was not to get back home but catch-up with the Sea Lions show. With no idea of the lions I entered the venue, which is a two storied high gallery partially enclosed and arch in shape with a blue pool in the center looking cool at us; and after waiting few minutes the black two lions emerged skating through the doorsteps behind the stage and took hold the stand up like table. I remember they clapped first with their fore flippers, following many amusing activities like playing volleyball, pool basketball, catching rings, diving into water... are all awesome; and their playful behavior, sharing kiss and splashing water on the audience on the first row were looked fun and fascinating. After a great amusement and lifetime experience disclosed by the pool stage, we head to the artificial lake hold within the City premises which also houses a boat jetty with small pedal boats and water cycles for a leisure and pleasure ride. But my bad chance couldn't agree for a ride unlike my parents and uncle family took around the small islands created amid the lake surrounded by tranquil and I had a spicy dinner with my uncle at the restaurant located aside the lake, where cool breeze wake up to the off shore and whisper of waves embraced. I still remember, we had noodles and chicken 65 sitting on one of the tables under the thatched roof restaurant surrounded by trees and lake beside. We also had opportunity to visit the Little Folks on the other side of road and it was already late evening and time for closing the entry, but we managed to get tickets and like the name referred it was a very little amusement park left with a sliding pool and few small riders for kids. My bro and cousin tried the sliding pool and we can’t spent much time there while there’s nothing to do and the lights were turned off we forced to head out quickly. We visited the Dolphin City in 1998, that was nearly 15 years ago but I just inspired to write on the experience now... after reading one of my friend’s blog post on cities. The Dolphin City and Little Folks stopped its operation at the latter years of last decade and the dolphins were also died very soon after our visit and they continued with sea lions shows for sometime and now only the building is remain. I think the title reveal it all, but that isn't enough and there’s something much more to behold bewitch and enhancing about the film that words could mere describe. With no subtitle I watched this Chinese movie moves with light hearted emotions between a father and son amid stunning mountain scenery and remote villages, leaves a deep impact at the rear fall. With the soothing traditional Chinese music, the movie wakes up to the misty morning among the mountains and patches of green fields; where a young man leaves his home with backpack of letters or mails on a journey as a postman at the mountainous rural areas of China. Back in memories, his father, who forced to retire due to a bad knee decided to accompany his son who succeed his job as a postman for years, on his journey exploring the routes and mail recipients. The film embark on hiking routes throughout, walking up and down the valleys and climbing mounds and crossing rivers, the father guides his son from behind on the nitty-gritty of the job, makes him realize that it’s not just a job of distributing letters but being courtesy and generous at exhibiting friendship with villagers. There are many popup flashbacks alongside the journey sending bond waves of memories embrace with current emotions and gestures between the father and son is remarkable. Almost light warming, damp and dew, the film beholds some visual treat and the way of nature exists was enchanting and breathtaking, while no trace of added special effects or use of technology everything sights simple and beautiful. Not to forget the German shepherd that accompanies all the ways ahead their journey emphasis with its gratefulness and as a guide signals at certain attain. 'Postmen in the Mountains' is a 1999 Chinese movie – originally titled as 'Nàshān nàrén nàgǒu', based on a short story set in the early 80’s, around the mountainous region of western Hunan province of China. The movie attracted me so much or I moved to core by watching it that I would recommend anyone to watch it in silence (not putting at mute) and it doesn't need any dialogue to understand where gestures speaks a lot! PS. 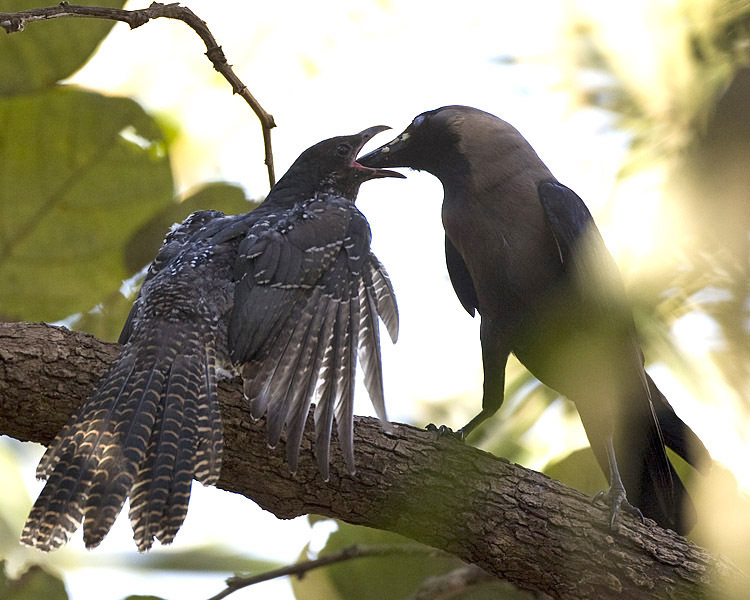 Inspired by the Crow Koel relationship. 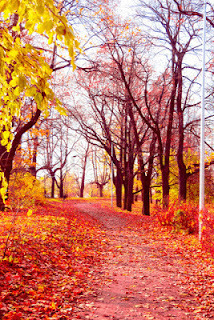 to come stick hold and intimate! This is a post on the remaining photos from my last outing on ECR in August and it’s been nearly two month I went out of home except couple of time to watch movies and beach visits, since dad got cataract surgery in the middle of August. For more than a month mom was the only person to take care of me quite and so it wasn't easy for me to think of going out and giving much trouble to her but I have a great company of birds and wonderful weather around. 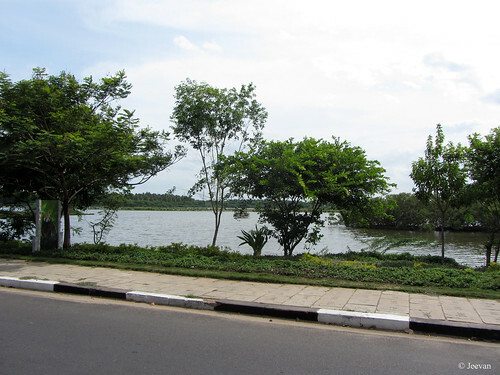 I hope you all remember my visit across the Kalpakkam Township – a quiet green residential area of Indira Gandhi Atomic Power Station and it has a beautiful backwater lake and small calm lagoon delta to unwind. 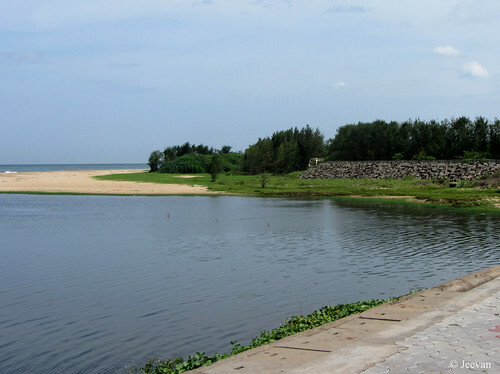 It was mid noon when we come around the backwater channel that divides the township and it has a well laid platform aside the lake to stroll at leisure in evening. Wish I could be there again one evening experiencing the unwind moment and whisper of waves. 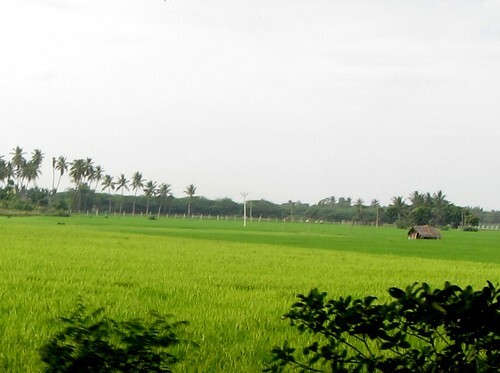 There are many paddy fields on the way to Kalpakkam and they are all evergreen in light and dark shades compare to the growth of stalks. When people are protesting against the Nuclear Power Project in Kudankulam, Kalpakkam stands very close to the farm lands setting an example of unchanged environment and greenery against the thought of Atomic Power Stations will spoil the environment and threat livelihoods. I think the protest in Kudankulam is unnecessary and when many experts expressing their vows that the Power Station is fully protected, there is no mean for continues protest. Everyone knows that Nuclear power is harmful but there’s a way for handling everything at safe and there isn’t certain that only the nuclear power would destroy lives than anything else. 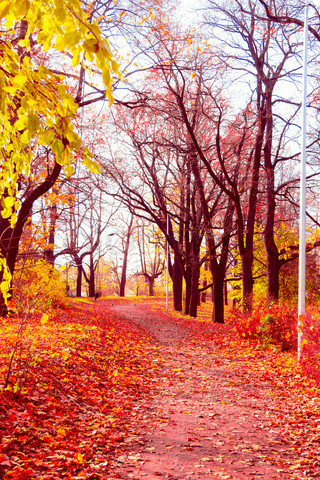 We move only by hope kept forth and there’s risk at every turn, so could we stop traveling and progressing in life? 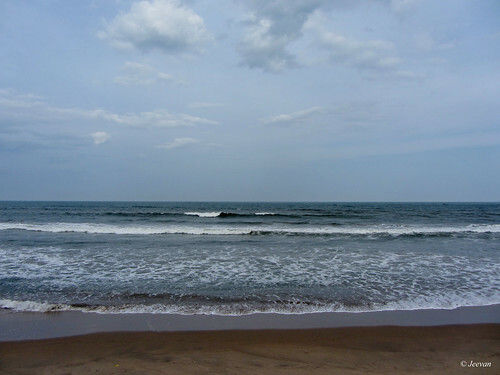 Wish government take steps to clear their unsecured feeling and peace returned to Kudankulam and Idinthakarai! Last year I come around the core area of Chennai, the so called Mount Road, Central and Parrys and got to capture some remarkable buildings and landmarks of Chennai; and one among them was the YMCA Building. Young Men’s Christian Association building is an architectural marvel located on the NSC Bose road in Esplanade; and it was the first building to be built in Madras at the request of then Governor Arthur Have-lock in 1900. YMCA Esplanade is the oldest branch of the Madras YMCA, established in year 1890 by an American Secretary Mr. David McConaughy in the South Indian State of Tamil Nadu. 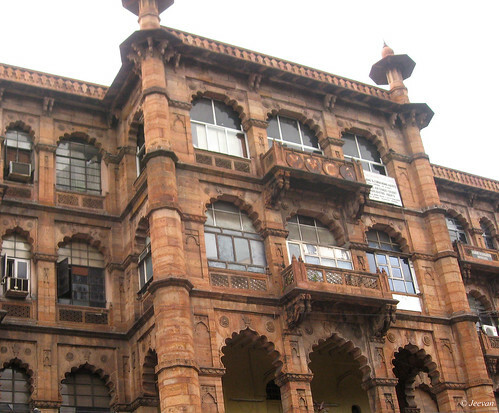 YMCA is a Jaina-Jaipuri style of building, began its work in 1895 was completed by a donation of $40,000 by John Wanamaker, the then Post-Master General of the US. 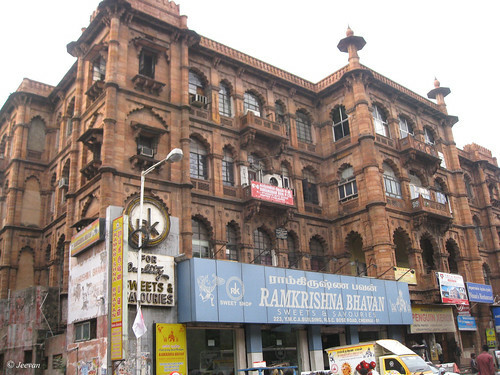 The building was designed by G.S.T Harding and it is one of the oldest heritages of Chennai – the then Madras. Yesterday I heard unusual chirping or screeching from outside and I moved to check what was happening on but I saw an amazing scene I ever seen or known before. There was a Koel Chick perched to the Gulmohar tree in front of our house and a Crow sitting next to it; and apart wondering from where this Koel chick came all of sudden with no sign of it emerging around, I puzzled by their behavior. First I felt very sorry for the Koel chick thinking that it got trapped by a crow and was struggling to escape from its piercing bite; but only observing carefully I found that the crow was treating the chick. It was the scene continued even today with another male chick joining the feast, but their behavior doesn’t look so kind for me even I watch closely that the crow drop its beak into the chicks mouth holding something. I couldn’t come out of amaze after coming across this sight and as I know Koels or Cuckoos lay their eggs on crow’s nest but the behavior of crow truly mesmerize me with its attitude toward the Koel chicks and feeding them as their very own. For just the reason of eggs found on their nest, how come the crow adopt the Koel chicks or is it the color that resembles the crow took them easily under their shelter, crows simply seize me to amaze. 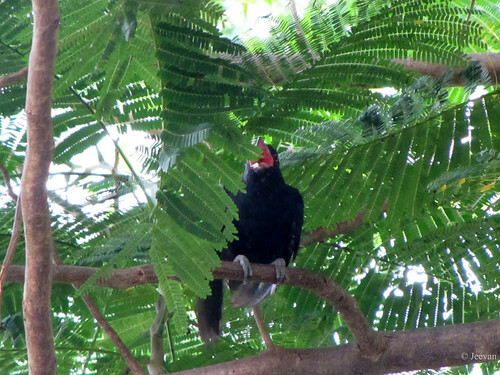 It is told that Koel chicks grow very fast, so it took some time to confess me that they are not the adult Koels which reside among our neighborhood. There are couples of paired Koel in our area that they all rarely come around together, but I got to capture them at many occasion and this is first time for me on their chicks. 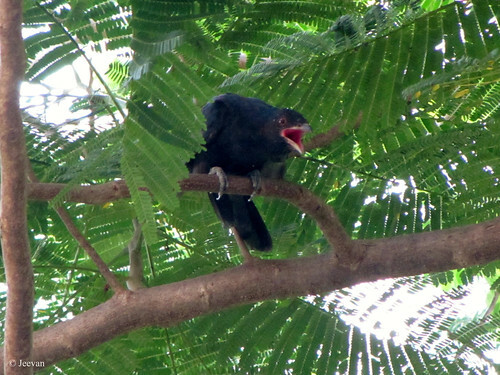 I couldn’t capture the moment of crow feeding the koel and the photos above were on the male koel chick – mouth widely open, which was the only indication, identified me the chicks. without her there’s no sphere. love, even in bitter cold weather. her bosoms feels the comfort at home. she’s a magic wizard to disappear the fear. who’s foremost lover of any living species. holding breath for fetus to inhale in womb. where no one can stand against her wisdom. a mystery only she can understand. lets new lease of lives set in. Mahatma Gandhi Memorial is constructed on the seashore of Kanyakumari - the southern tip of India, where his ashes were kept for public view before immersion in the sea on February 12, 1948. 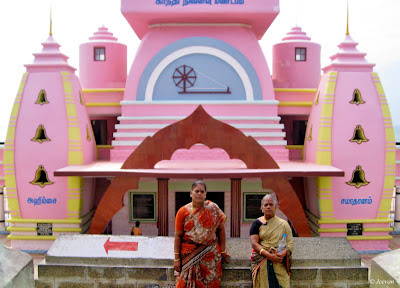 The Gandhi Mandapam is built in Orissa style of architecture and designed in a way that the rays of the sun falls exactly on the place where the urn was kept through a hole on the roof, on his birthday of October 2nd. The beautiful Gandhi Memorial completed in 1956, is situated as a memorial to the Father of the Nation; and its central shape is 79 feet high representing the age of the Mahatma. 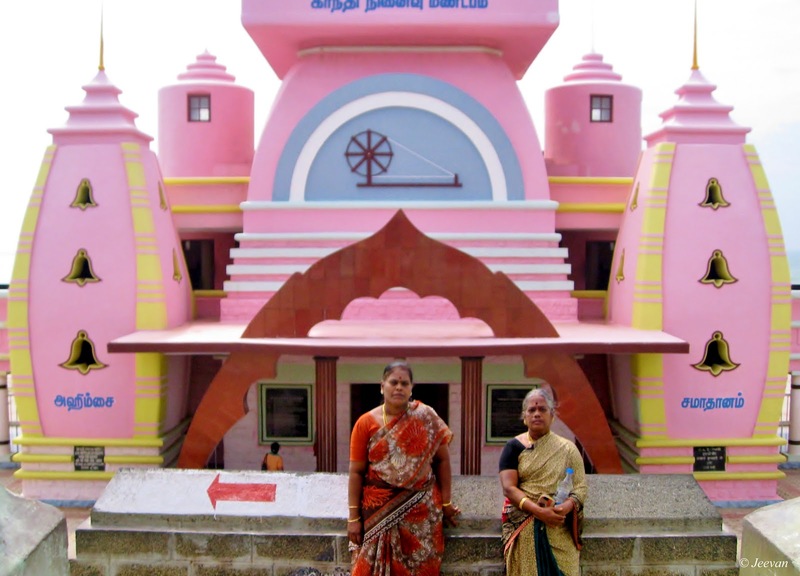 The memorial was transferred to the administrative control of the Public (Information and Public Relations) Department from Public Works Department of Government of Tamil Nadu in the year 1978. We visited Kanyakumari last year end and I could only view the beautiful exterior of the memorial from road, since there are few steps leading down the entrance. I capture few photos on the memorial but due to lens problem then I couldn’t get a clear picture, so borrowed the first one from my cousin and the 2nd one was the only better I could take, with mom and grandma standing in front of the memorial.